I consider my work with Heritage Community of Kalamazoo to be some of the most meaningful work of my career. 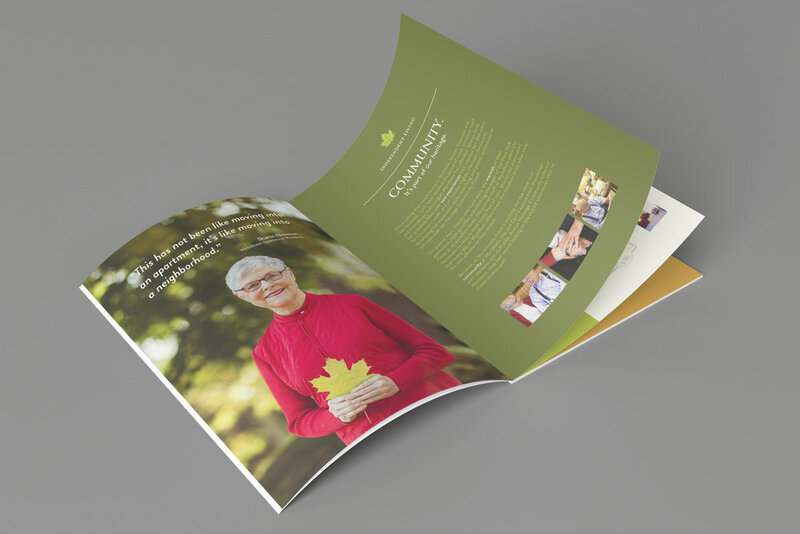 Three years ago, we assisted Heritage in rebranding and finding a new voice. I worked with a couple of different art directors on a refreshed logo, new tagline, and fresh print materials to share the Heritage story with target audiences: both prospective residents and their children. I also worked closely with the CEO to create a development strategy for the foundation, with giving buckets and personal stories to better focus donors and connect them with Heritage's core mission--that no one who comes to live at Heritage will ever be asked to leave. If you live longer than anticipated, you will still be cared for and welcomed in the Heritage Community. The efforts were a rousing success, leading to an explosive response in the community, 3-6 month waitlists for interested residents, and a new master plan for building another facility. This past year, Heritage returned to take an audit of materials, update what needed to be tweaked, and strategize together on where the brand was headed next. Over the course of our work, we proposed a very unique video series so the stories and dignity that Heritage so naturally celebrates in its residences could be shared online. Heritage was intrigued. I worked as director for the shoot, interviewing 20 different residents whose stories I had studied and capturing those stories on film. Together with our production specialist, I cut together the films you see below. The incredible people I met--their life, vibrancy, playfulness, wisdom--are who they are today thanks to the sense of purpose and community they enjoy at Heritage Community. I will forever be honored to have captured their stories. We entered our favorite video (Wisdom) to the Addys, and it won Gold.